In reading Rooms, it was driven home to me once again why negative reviews aren't something I want to invest my time in writing. I learned that some of the complaints I had heard were valid, some less so, but I still really enjoyed reading this book. And I almost let the naysayers rob me of the experience altogether! Other people's opinions can only take us so far—ultimately you are the best judge of your own reading tastes. There's no substitute for taking a big bite of a book yourself. And I think Rooms is definitely worth sampling. It's about a house—an old house, with lots of history in its walls and floors and crevices—and a family struggling to hold itself together. The house's owner, Richard Walker, has died, and his family has convened there in order to go through his belongings and settle his affairs. His ex-wife Caroline is barely functioning, cracking open the vodka well before noon. Their daughter Minna is trying fruitlessly to give meaning to her late twenties by engaging in a string of empty trysts. Her brother Trenton, at sixteen, is friendless and depressed, a laughingstock at school and virtually ignored by his mother. Then there are the ghosts. Richard Walker's living family members aren't the only ones rattling around the big house—Alice and Sandra, both former tenants, are bound tightly to the structure through their own tragic histories. They observe the Walkers with trepidation (Alice) and gleeful judgment (Sandra), but eventually they'll both have to confront the grief and guilt that have tethered them to the house in death. This book is certainly dark. It's hard to imagine that one house can hold so much tragedy and misfortune. Nearly every character is lost, hopelessly mired in her own flaws. But Oliver is a skilled writer, and I don't mind reading about sad, screwed-up people if they're crafted with such sensitivity and clarity. 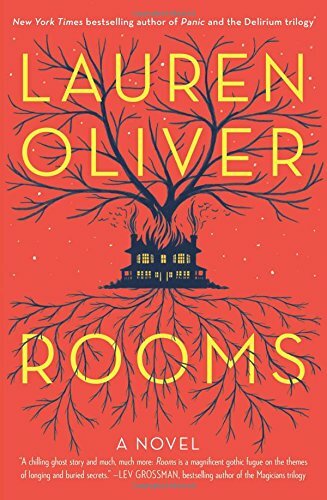 Atmospheric and haunting, Rooms is best read on an overcast day, with the bare branches of a tree tapping mournfully against the window and the wind howling a dirge.